At Cycling Into The Future we designed a comprehensive six module training program designed to teach kids how to safely and confidently operate and own a bike. Each session lasts roughly an hour and is supervised and led by Cycling Into The Future instructors. A brief summary of each of our six sessions is provided below. Our Covenant of Inclusion ensures that all students can participate in the program regardless of experiential, financial or other barriers. Find out more. Classroom instruction which includes a detailed session on rules and safety. There are sections on bikes & the law, understanding right-of-way, and basic principles for riding safely and defensively on the road. Students learn to take apart a punctured tire, find the problem, patch it, and put everything back together again. 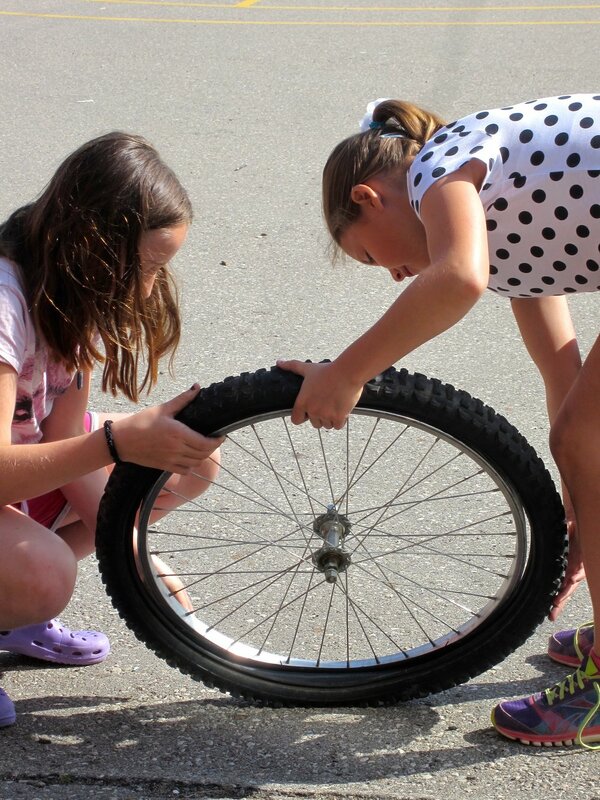 Students learn to inflate their tires and fit their helmets properly. A bike mechanic then does a quick assessment of each student’s bike and works with students to make minor repairs and adjustments in preparation for rodeo and road riding. Participants practise rules, safety and performance skills in the controlled setting of the schoolyard. Challenges include straight line riding (with shoulder checks and signals), stopping and starting drills, and games to enhance balance, control and handling skills. Participants go on a 75 minute on-road session in a small group with trained instructors. Students apply skills learned during the bike training course in actual road situations. Safety is our primary concern. None of this training takes place on busy streets. Students are taught to choose appropriate routes, in conjunction with parents. Teachers assess student achievement throughout this course, based on the Active Participation and Safety expectations in the Health and Physical Education Curriculum. Students complete an on-line test that reviews important learning from all aspects of the program. Students also complete a self-evaluation, reflecting on their participation and learning in the various aspects of the course. We seek out teacher, student and parent evaluation of the course itself. But what if a student doesn’t even know how to ride in the first place? At Cycling Into The Future we feel every child should have the opportunity to ride a bike and participate in our program with their classmates. This is where Learn To Ride comes in. This is our separate learning program where we provide instruction and help to children, mostly 1 on 1, with the very rudiments of cycling ~ balance and control. In the past two years, we have taught 91 students how to ride for their very first time. • If students cannot afford to pay the registration fee we have an agreement with schools that they will pick up this fee. • If a student does not know how to ride a bike we will provide learn-to-ride instruction. • If a student cannot get a bike for this course we will give the student a refurbished bike to keep. • If a student cannot get a helmet for this course we will give the student a new helmet to keep. 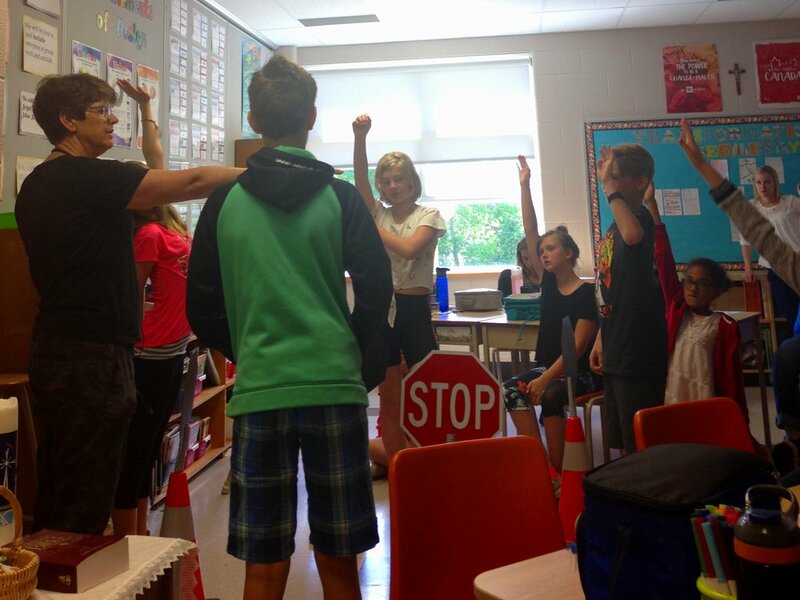 • If a student has a challenge that might prevent full participation in the course, we will work with teachers, students and parents to provide as much instruction as possible.